You are going to be extremely lucky not to have the odd problem occur during your Project life-cycle. Therefore you need a process to deal with this eventuality which is called Issue Management. You need to remind your team of the old adage A Problem Shared is a Problem Halved. 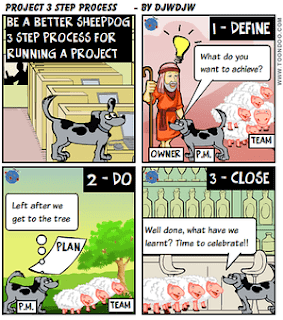 Here are my tips on the Issue Management process within Projects. Logic would dictate that after a bit of education mentioning A Problem Shared is a Problem Halved, Project team members would diligently raise Issues by making an entry in the Project RAID log. Well in my experience there are one or two people who would do this and the rest are too busy, too lazy or don't think in that way. There are also some that would go over the top and put lots of "problems" which I don't believe should be on the Issue Log (see later on for discussion on this). And don't think that a quick bit of training is the solution, sadly Newton's 1st law of motion needs to be considered. So taking the path of least resistance I ask team members to send me an email if they think there is a Project Issue. I also remind Risk owners that they should be monitoring their risks and alerting me if one materialises. I ask them to put "Issue" in the subject title too in line with good email principles but this may / may not happen thanks to Newton! Sometimes even a quick email is too much for a team member, chiefly because some team members don't think in that way / are super optimistic the problem will be resolved very shortly / "insert reason-excuse". So as you perform monitoring and control you should be on the lookout for anything which should be tracked as a Project Issue. 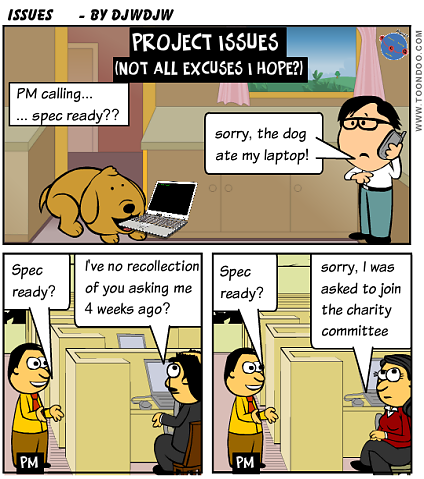 What level of Problem goes into Project Issue Management? "Harry has a different opinion to Joe on a design"
"I'm not feeling well today"
"My PC has a problem which has delayed me by 3 hours I set aside to complete the specification document"
I'm sure there are different opinions out there but I wouldn't expect to see the 3 above in a Project Issue Log. The Project Team need to take personal accountability for tasks and the 3 examples above are just low level problems which an individual should handle although all have the potential to become Project issues, I will explain further on in the post. What happens after the Issue is logged in the Issue Log? I use the Position / Comments column in the Issue Log to allow updates on status to be recorded with date and initials. Once the issue has been resolved, the status can be marked in the log with a closing comment made. For some Issues, you may struggle to resolve them within the Project team. Sometimes it is necessary to involve the owners of the Project either on an informal or formal basis. I will return to this topic in a future post. Issue Management defines the recording of Issues defined at an appropriate level and the ongoing management and monitoring of resolution activities which need to be undertaken by individual Issue owners assigned on a case by case basis. Sounds simple!